The compact size and undoubtable beauty of New Zealand sets the scene for an unforgettable road trip. 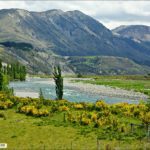 Forget long stretches behind the wheel on this adventure and be captivated by the impressive and lightning fast changes of scenery of the South Island. Think of the grand scenery of Canada (10 million square kilometres) condensed into an island covering only 84,000 square kilometres! 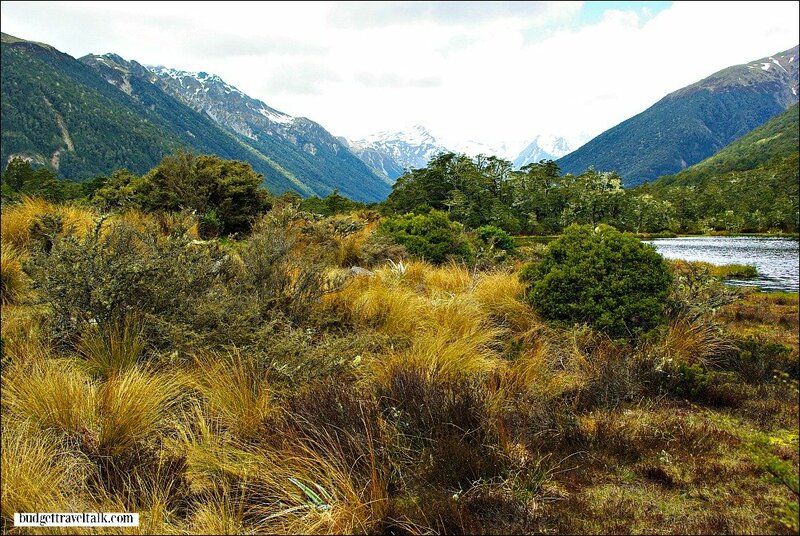 Green pastures… woolly sheep… sandy beaches… snowy peaks… rugged Lord of the Rings country… quaint country towns. There are wild animal encounters, both organised and spontaneous with seals, dolphins and whales, great seafood and a list of adventure sports to keep your adrenalin pumping. There are glaciers to land on, gorges to bungee jump, thermal springs to luxuriate in and world class tracks to hike or in Kiwi speak tramp. Oh and don’t forget those ski-fields and cosy fireplaces. Most people will tell you, of the two major islands of New Zealand, the South has the most stunning scenery. We have lots of Kiwi friends and they agree. Have you been to both? What did you think? We suggest at least two weeks for the South Island. It really comes down to personal choice but we loved the campervan experience. Being able to prepare a meal anywhere, anytime and with a stunning view. Having accommodation on-board provides itinerary flexibility. No daily packing and unpacking. Just climb in the back for an after lunch siesta. NZ Campgrounds are often geared to handle bad weather and offer campground camaraderie. The one we chose at Franz Joseph had a huge kitchen with top of the range stoves, lounge with comfy chairs and log fire, loads of washing machines, clothes dryers and even a bar and hot tub. Of course not all campgrounds are created equal and the old adage – you get what you pay for applies. Some were very basic indeed, which leads me to my next point. 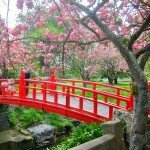 WikiCamps NZ. We are enthusiastic users of the WikiCamps Australia App. 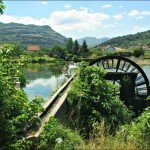 For the uninitiated this App is a crowd-sourced database of campsites, caravan parks, backpacker hostels and day stops. It hadn’t been born when we last visited NZ, but we look forward to using it in future. 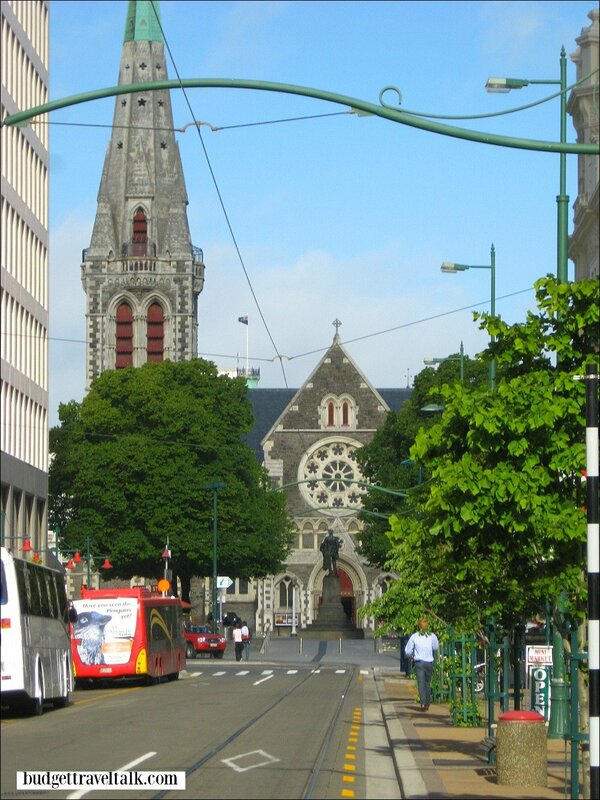 As we’re just touring the South Island we’ll start and finish the road trip in it’s quake-shake Capital of Christchurch. This is where your flight will land and the town is geared toward travellers. There are motels close-by the airport and a selection of Car Hire Places. The airport is located on the northern outskirts of the city, which fits in nicely with our itinerary. The cathedral’s future is uncertain. 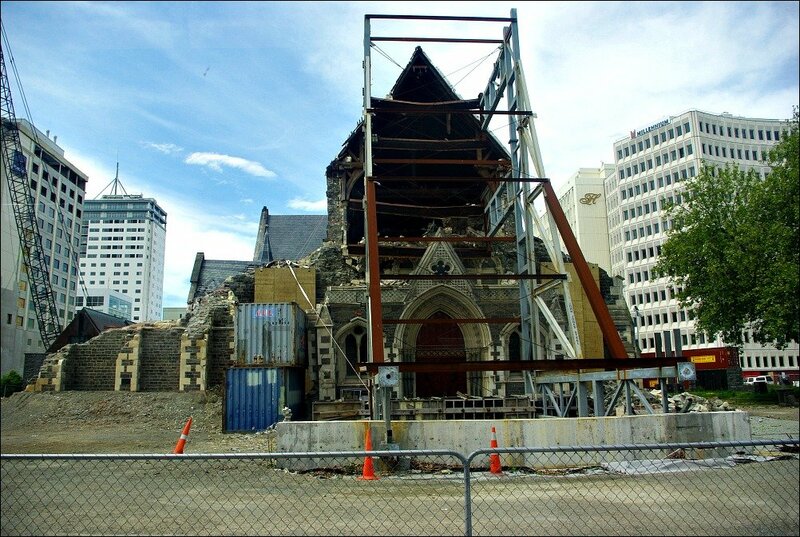 The Cathedral was the city’s much loved landmark and tourist draw-card, until the 2011 Earthquakes damaged it so badly, that the Anglican Church was in favour of knocking it down and building anew. The ensuing debate divided the community. In 2015 with no decision yet made on the Cathedral’s future, the government stepped in and appointed a negotiator. 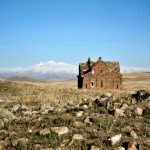 It was decided the church would be saved – only nothing has happened to date. 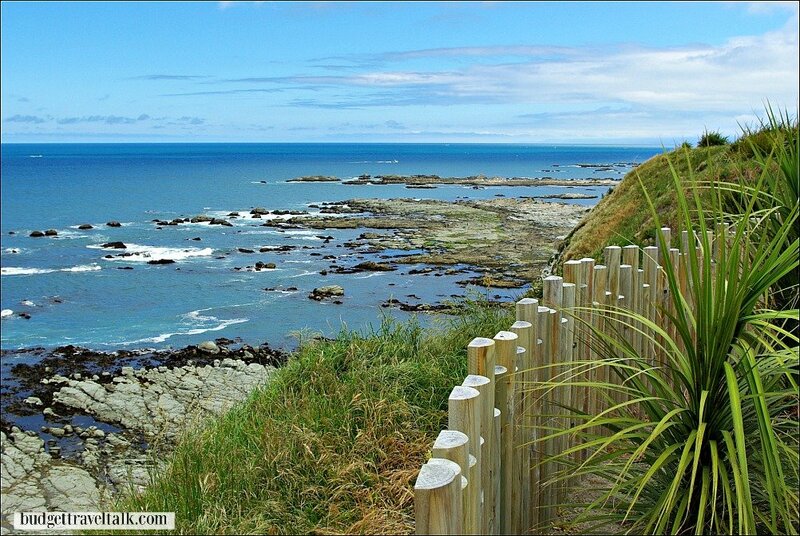 Kaikoura on the coast north of Christchurch, is the place to go for dolphin/seal swimming experiences, whale watching boat tours and seafood extravaganzas. If like us you miss the boat tour, be sure to walk along the headland track to view the multitude of seals sunning themselves on the exposed rocks beneath (bring binoculars). The cliff top walk offers great views or it is possible to rock walk at sea-level. Failing this, the road north of Kaikoura hugs the coast with opportunities to watch seals sun-bathing while their pups play in nursery rock pools left by the tide. 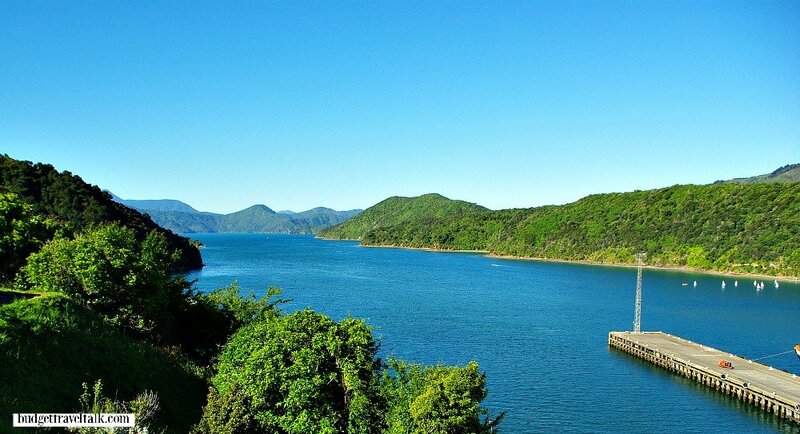 As well as providing the ferry connection to the North Island, Picton is a departure point for dolphin swim and view trips within in the calm waters of the Marlborough sounds. Havelock, Pelorus Sound and the Queen Charlotte Track. The scenery on the drive from Picton to Havelock is a water colour mix of greeny-blues and up-downs. Across the sound, Queen Charlotte Track, one of New Zealand’s most beautiful walks has water connections from Picton. Just looking at those mountains made my calf muscles ache, but evidently the 3-5 day walk has a moderate fitness level rating. The track is undulating ranging from sea-level to 400 metres and is open to mountain bikes. The expansive Pelorus Sound wowed me much like Australia’s Sydney Harbour does. 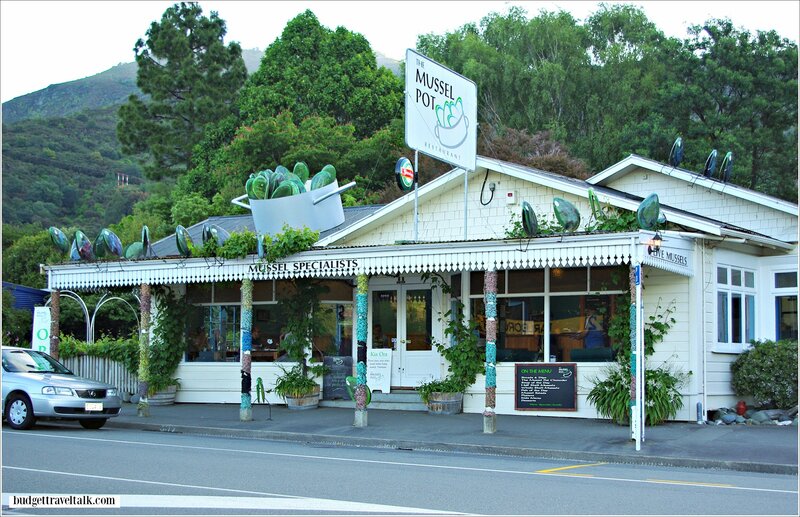 Havelock, a small town at the head of the Sound, is known for Greenshell Mussels and we sampled a variety of flavours at the Mussel Pot – and yes they were delectable. Other Seafood is served and there is a lovely timber dining deck off one side. Mussel boat trips leave from Havelock harbour. We waved goodbye to a sunny Havelock but just half an hour later the mountain road was swathed in dark clouds and rain. The drive was atmospheric and suspenseful, but the weather cleared in time for our next stop – Nelson’s Saturday market. 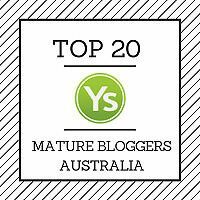 This smallish market punched above it’s weight. While I collected gifts, Marty used his superior coffee tracking skills to grab us some caffeine and muffins. Then it was full steam ahead for another National Park. 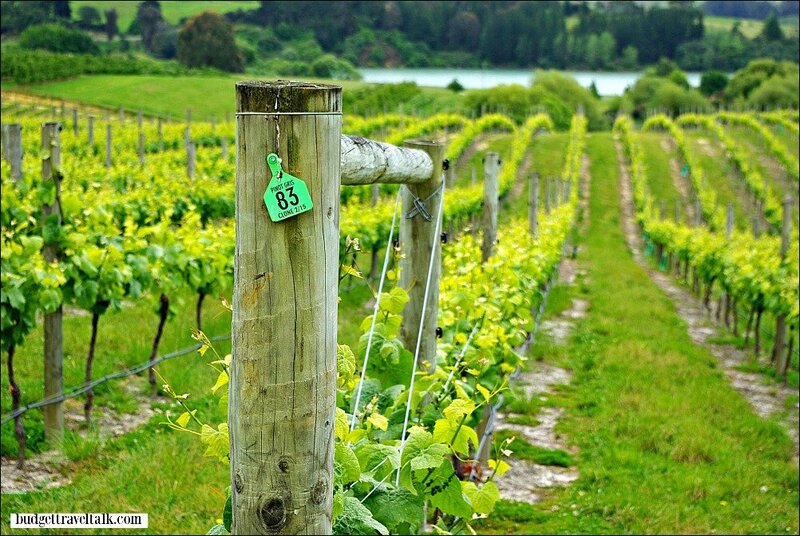 Wine in the South Island. OK, there was one slight diversion. The Marlborough region south of Picton is the Sauvignon Blanc capital of New Zeland (Oyster Bay I’m looking at you), but we picked up a Pinot Gris on the way to Abel Tasman, at Rimu Grove and enjoyed a van picnic with this view. 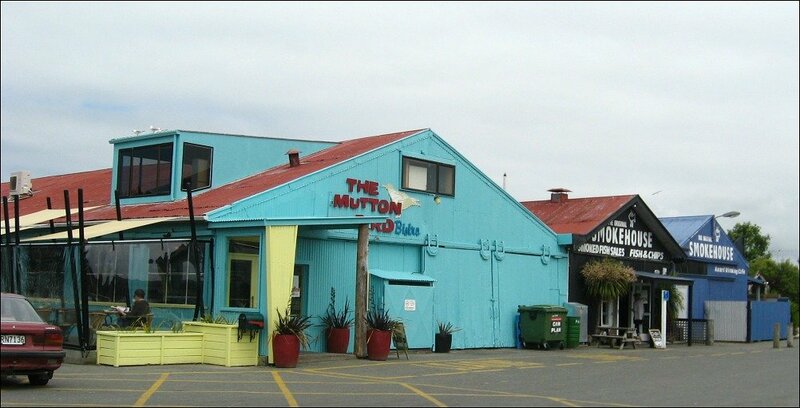 Across Tasman Bay from Rimu Grove on Waimea Estuary, is Mapua Wharf with it’s interesting collection of speciality shops, galleries, restaurants, bars and cafés. The Smokehouse, hot smokes mussels and local fish in traditional brick kilns with shavings from the native Manuka tree. 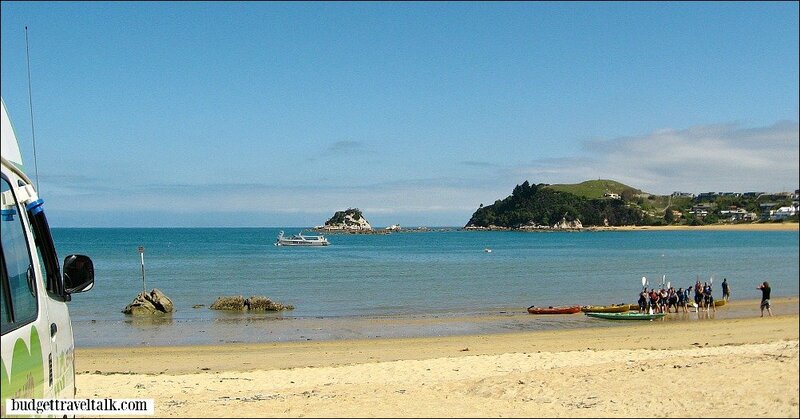 Abel Tasman is the smallest but most visited National park in New Zealand. The Track itself is not strenuous and takes 3 to 5 days to complete. The hike can be broken up into hiking, kayaking and water-taxi segments, with endless mix and match possibilities. Or – just cruise the park in style by catamaran. 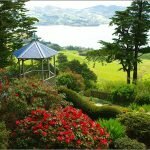 The Department of Conservation has four hiking huts en-route (book in advance), or camp under the stars or stay at comfy lodges at Awaroa and Torrent Bays. It’s easy to see why the Abel Tasman is so popular. On the southern end of the park, Kaiteriteri Beach is the place to hire kayaks or board a water taxi to the beginning of your walk. From Abel Tasman head south on the picturesque Motueka Valley Highway, arriving two hours later at the 110 m long Buller Gorge swing-bridge. 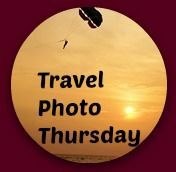 As I had not yet challenged my fear of heights and moving structures, I declined to cross the gorge, but Marty happily walked the bridge and zip lined back. Buller Gorge Suspension Bridge and Flying Fox. 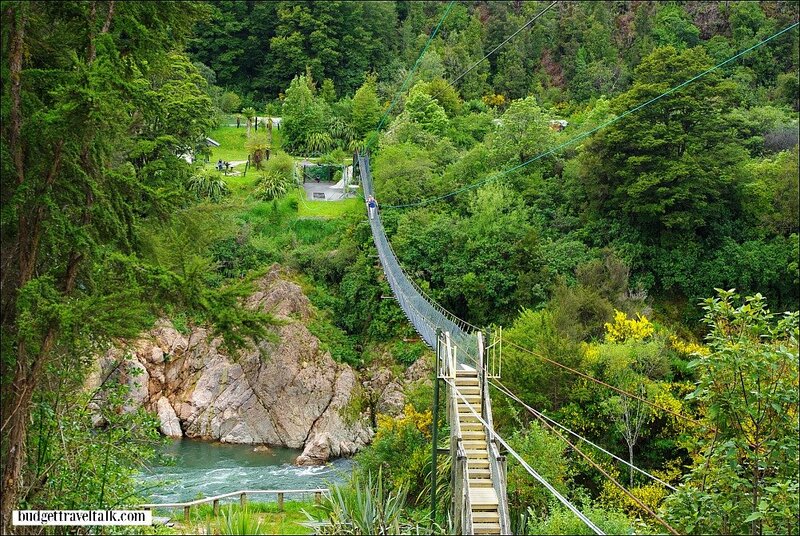 The longest swing-bridge in New Zealand, Buller is 14km west of Murchison, a town famous for it’s Class 2-4 Whitewater. Take a break at Murchison if you fancy rafting, jet boating, gold panning, fishing or mountain biking. Or check out this cute church. 23km south of Murchison these falls were created when rocks blocked the original channel during the 1929 earthquake. Along Highway 7, which links Nelson on the north coast to Christchurch in the east, or Charleston and Greymouth in the west, are Maruia Thermal Springs. 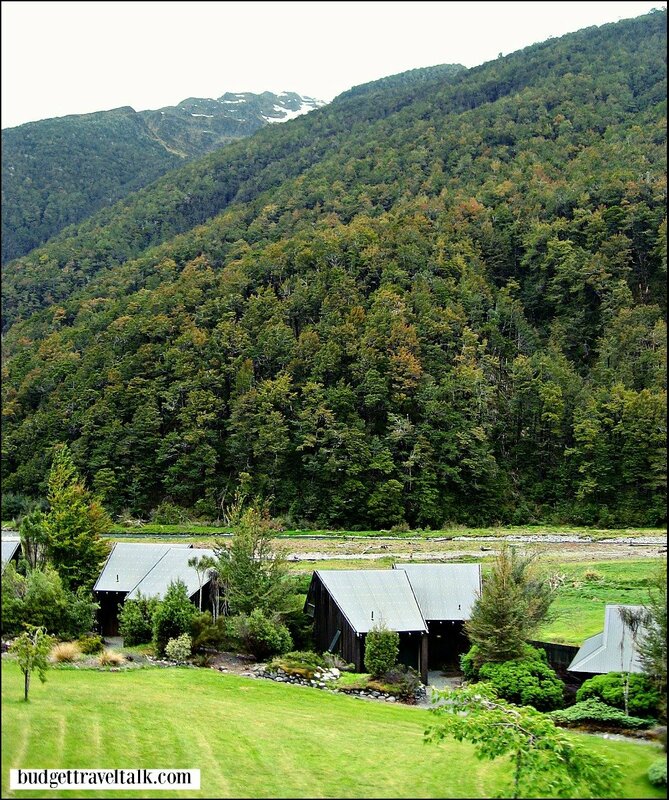 The springs are in a secluded valley in the Lewis Pass National Park with views to forested mountains and snow capped peaks. The first timber bathing hut was built in 1904 and when we visited in 2008 the Japanese Ogino family offered an Onsen bathing experience. In 2015 a New Zealand and Australian partnership purchased the springs, describing them now as a Pure New Zealand experience. During our visit the internal baths were segregated but now all areas are communal. I enjoyed the long communal foot tub situated on the verandah, where we sat fully dressed, our eyes soaking in the mountains and our feet in hot spring-water. The outside circular rock pools differed in size and temperature. Tip. Remove silver jewellery as the water darkens and dulls the silver. Cost. All day Adult Pass $25. Family $65. Another thermal activity town between Maruia and Queenstown is the well-known Hanmer Springs. 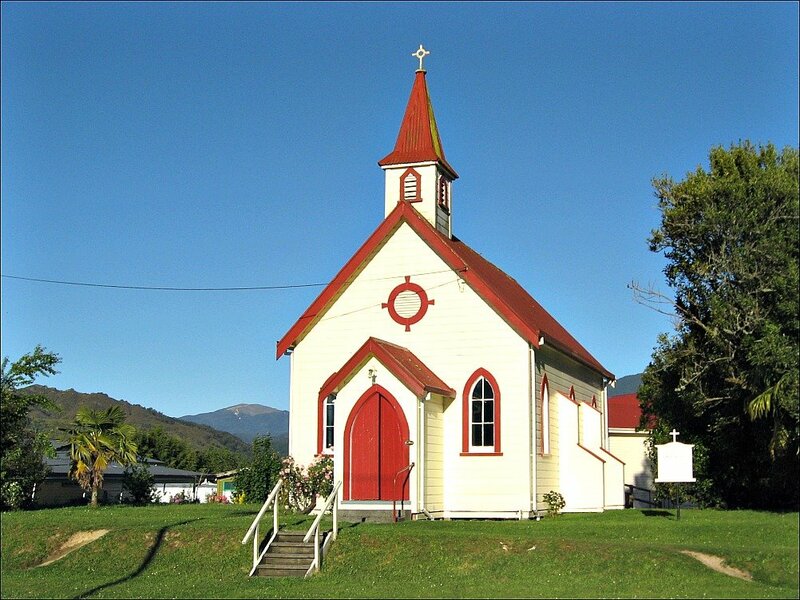 Whereas Maruia is a secluded spot, Hanmer is a pretty cashed up looking resort town with a ski-field in Winter. We were all soaked out by the time we got to Hamner so didn’t try the Springs themselves. Cost. 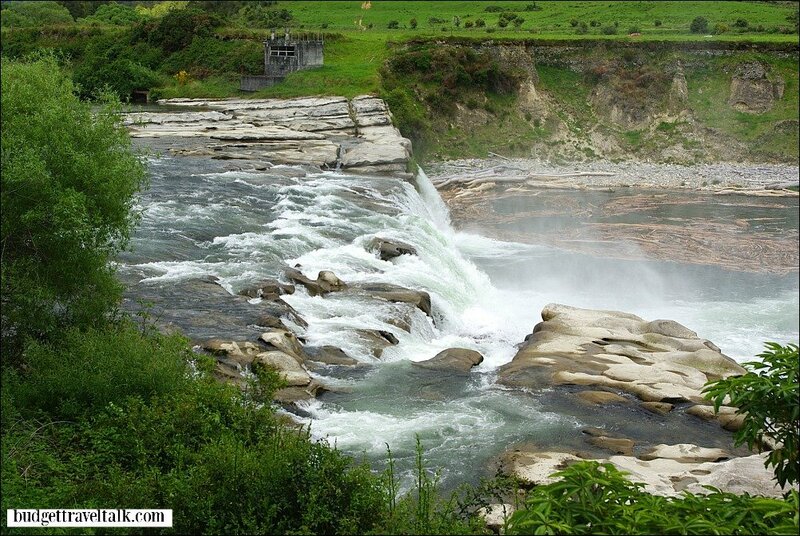 Similar to Maruia Thermal Springs. What a beautifully wild place. We couldn’t resist brewing up a hot drink and enjoying the view. Next week in Part 2 we zig zag east toward Christchurch, then back through spectacular alps scenery to the west coast before finishing on the highest main road in New Zealand. See you then. Have you done a campervan trip? Tell me about it! 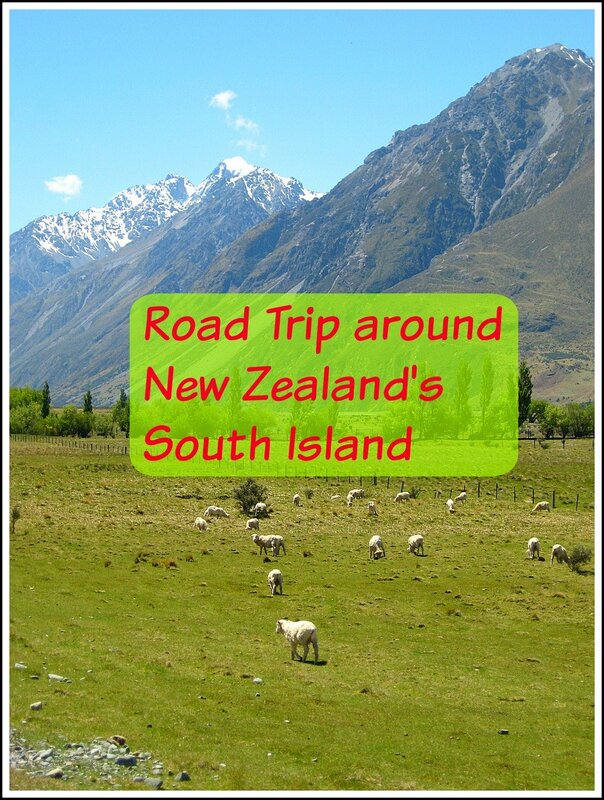 Part 2 of a Road Trip around the South Island of New Zealand. 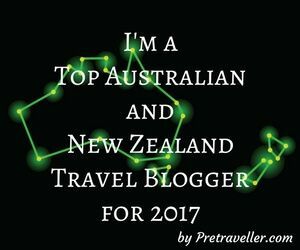 Yes the south island is a wonderful place to start! 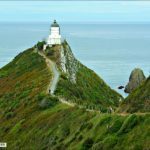 One day we’ll get to the North Island Nancie – but the south is just so damned beautiful! We always like to see a bit of everywhere – couldn’t resist driving north! Jan, you are my road trip super hero! I am looking forward to next week. I am already captivated by the pictures you have posted. I agree a campervan is the way to go! Road trips are so good Ruth. I’m glad you enjoy them too. As always I love the journeys you take me on and this one is no exception. The Mussel Pot calls out to me. And so glad they voted to save that wonderful old church. . .someday, anyway! Stay tuned in the next few weeks Jackie – there will be more. 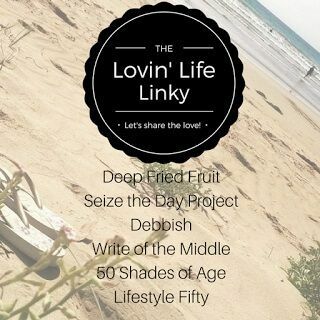 Gosh how tantalasing – being there on business without a chance to road trip! Impossible. oh, that seal pup is adorable. 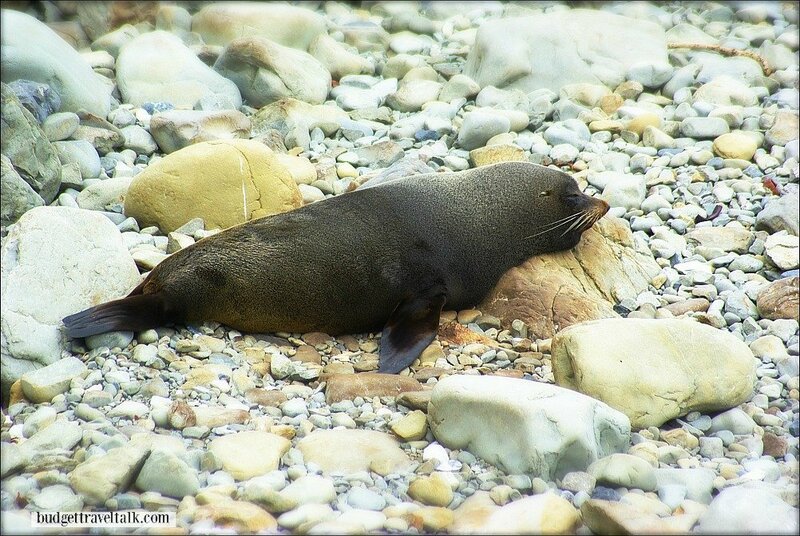 Lots of seal encounters to be had in the south island Sharon! Nice start to your road trip. I have spent many weeks traveling the South Island and it is a remarkable palce. It really packs a punch for such a small place. Lucky you being able to visit often. I’ve never been to the South Island but I really do want to go there. 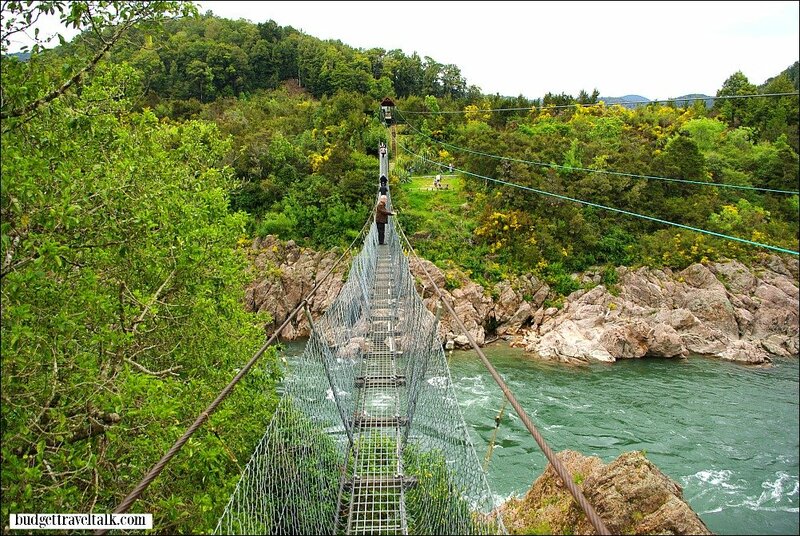 I can’t bear to cross suspension bridges either. I was never afraid of heights as a child but I am now. Good on Marty, he’s a legend. Ha ha – I won’t tell him that! Yes the similarities between N.Z. and Canada is obvious to me too.